Pleasant Cape Cod-Style Home - One Block from North Bay! Osterville on Cape Cod. Pleasant Cape Cod-style home one block from North Bay just off Bay Street. Walk to village and shops. This house was renovated in 2009 and 2013. Solar panels were added in 2017. Ecotourism! Face Book page is osterville vacation rentals. This Non-Smoking home features a large family room with dining area. Formal living room and dining area. Five bedrooms, four baths plus game room and bath on lower level. Four of the five baths have been expanded, renovated and completely updated. Two zone central air and heat. Attic fan. Screened in porches, flagstone terrace, fenced back yard, Master bedroom deck. Two bedrooms with French doors to new deck. Well equipped beautiful kitchen. Laundry room. Mature gardens. This property is family owned. As soon as you step inside, you will feel the memories of happy family gatherings. Everyone is in different parts of the country and we cannot use our home as we did before. We have been leasing in the vacation and off season market since 2002. One television in family room. One in Master, one in game room on lower level. Mature and private gardens that attract birds. There are bicycles in the garage that may be used. Owner and property manager are not responsible for condition of bikes. Please use locks if leaving bikes unattended. Private clubs Wianno and Oyster Harbors are very close. Cape Cod has numerous public courses. Just what we needed for a fun family Thanksgiving holiday. This home is perfectly situated close to town, and an easy walk to beaches. The home is very well equipped, and perfect for entertaining! The owner has maintained this home beautifully! We’ll be back. Thank you for staying at Blue Heron House. We are pleased that you enjoyed your family time in our family home. We look forward to seeing you again. Outstanding! Perfect for our large family. 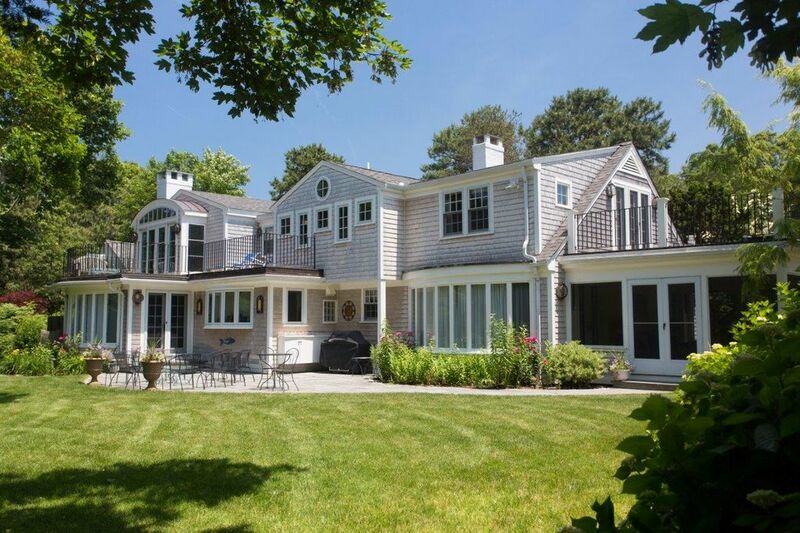 We spent five days in Osterville at this lovely home that was perfect for our large family. The house abounds with porches, patios and decks. The master bedroom is an oasis in itself. The kitchen is well stocked with cookware. R. made us feel quite welcome. We walked each day into Osterville for our morning coffee at Amie's. Overall, it could not have been better or easier. The home and property are really lovely and in an ideal location. It is a beautifully decorated classic Cape home and very comfortable. We had some minor, ordinary logistical changes to our plans that arose. First, we wanted to pay to arrive one night earlier rather than staying in a hotel. Then, on our departure date there was a miscommunication relating to the departure time of one of our ten guests and her belongings were still in the home when the cleaning crew arrived. Ultimately, everything was resolved, but the owner was very anxious about both issues and a good bit of communication was required. I would advise to confirm all plans in detail ahead of time, which we would have preferred to do as well, but is not always possible with travel. Wonderful Week in this Very Comfortable Home! judy s.Where do you live? Our family had a perfect week in this lovely home in Osterville! The space is planned well and we could enjoy each other and yet have quiet times. There were more than enough bathrooms for all and each was beautiful with unique tiles and fixtures as well as plenty of linens. The main floor bedroom and bath makes this home manageable for anyone with difficulties with stairs. We prepared Birthday dinners and other casual meals in the large well appointed kitchen with many participating in the food prep. The fireplace in the family room provided warmth on cool evenings and gave a lovely ambiance to this room. We enjoy walking and loved our daily walks into the village. The kids made good use of the beach passes and all in all it was just the best week for our family! Thank you so very much for the availability of this home! It is a wonderful large family home! We would love to return in the future! The minute I opened the door and stepped into the warm and inviting open kitchen/living/dining area, I felt right at home. My family needed a short term rental during January and February and we were all sad to leave when March rolled around! This home is so comfortable, spacious but cozy, quiet but walking distance to town, convenient to large box stores, and only a one minute walk away from great sunsets over the water. We'd spend another two months here in a second!! Thank you so much for such a wonderful rental experience! I rented this house with a group of friends for a weekend wedding. The house comfortably slept 12 of us and the location could not have been better as it allowed us to walk to and from town without having to carpool. Everything in the house was clean, comfortable and most of the appliances and bathrooms were brand new. We had a fantastic time and would recommend staying at this property for any type of Cape vacation!